In a saucepan, over medium-heat, whisk together the milk and cream. Cook until bubbles form around the edges of the saucepan. In the bowl of an electric mixer, fitted with the whisk attachment, beat the egg yolks and sugar on med-high speed. Whisk until thick and tripled in volume, 5 minutes. Reduce the speed to med-low, drizzle in the Olio Persian Lime Olive Oil slowly until combined. Occasionally scrape down the sides of the bowl. Slowly add the cooked hot milk, ¼ cup at a time. Slowly pour the egg mixture back into the saucepan, whisk with a handheld whisk until combined. Place pan over med-low heat to continue to cook, whisking constantly until mixture coats the back of a spoon or a candy thermometer reads 175 degrees F, about 15 minutes. Strain the custard through a fine-mesh strainer into a bowl. Place bowl in another bowl filled with ice and cold water. Cool down to room temperature, stirring occasionally. Cover with plastic wrap, refrigerate for 2 hours. Transfer to an ice cream maker and freeze according to instructions. 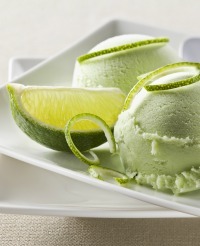 Transfer the gelato to a chilled container, cover and freeze until firm, 3 hours, before serving.